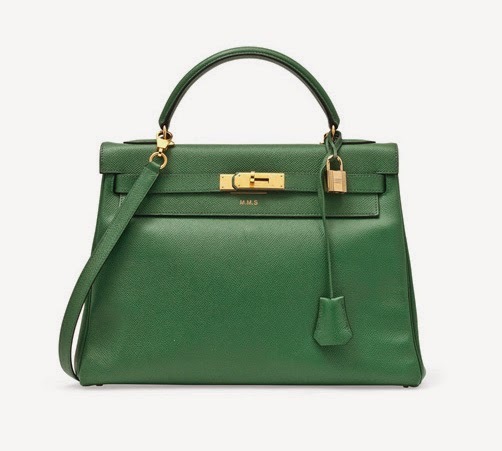 A 1994 Hermès Kelly 32 in green Courchevel recently offered in a Christie’s online auction. I had an interesting email discussion with a friend of mine who is currently on the hunt for a gently-used Chanel bag. We were both lamenting the dramatic rise in price of any Chanel bags, new or pre-loved—they now start, new, for a medium-sized classic flap, at $4,900, probably in an attempt to put them in the same crazy price stratosphere as new Hermès bags. My friend pointed out that one is drawn to one’s poison and often can’t help what they love, a sentiment I agree with! Life would be so much easier (and, in some cases, less expensive) if I didn’t so thoroughly enjoy the art and beauty of, say, Hermès scarves and bags, Chanel jackets, Cartier jewelry, among other things—and want to own them! 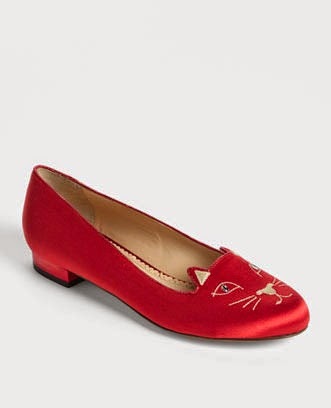 A Charlotte Olympia Kitty flat. Retail price: $595. My friend also touched on a subject I find endlessly fascinating—the guilt associated with wanting, and sometimes even buying, the most expensive items on the planet. I honestly can’t decide if this guilt affects moms more than child-free ladies (and gents)—or all ladies and gents alike. Do feel free to chime in on the subject whether you have no kids or many! My guilt revolves around thinking that I ought to be saving for some fabulous thing for my children (and no, I don’t mean college) instead of saving for a Kelly bag or Cartier watch. 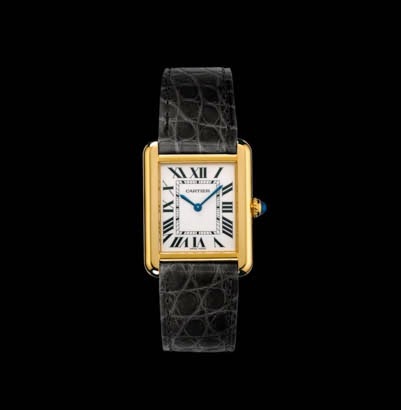 I love this Cartier Tank watch—elegant and classic! Some of my guilt is assuaged knowing my kids have plenty of food, clothes, toys, books, health and dental insurance, a lot of love, and both go to great public schools. It’s also assuaged by recognizing I spend little money on clothes—my closet is all about inexpensive basics and the real money is spent on accessories. My friend said that maybe she could get over the guilt of buying a Chanel bag because she makes her own clothes. I concur! If sewing the bulk of your own wardrobe doesn’t give you a pass to treat yourself to one pre-loved Chanel bag, I don’t know what will! I have never felt one shred of guilt for buying my pre-loved Chanel bag (from Fashionphile) or any of the few Hermès scarves I own—after I purchased them. A few special things have made me feel so grateful for all that I do have, in my closet and in my life, but I also understand that getting past the guilt in order to buy those special things can be treacherous! My pre-loved Chanel bag. Glad I bought it when I did! I would love to hear from anyone with anything to say on the topic of the morality of owning expensive things—and I do mean things, not travel or experiences—which I feel belong in a different category. Is owning something expensive, or wanting to, neutral territory for you? Do you feel an expensive item, whether a piece of jewelry or a bag, a pair of shoes, an amazing jacket, is a reward for hard work, whether it came by way of a promotion, or a big goal met, or the good old fashioned method of saving up for it? Detail of “Le Laboratoire du Temps,” by Pierre-Marie for Hermès, 2012. Do you feel an expensive item has a morality attached to it? Is it bad to like expensive things? Bad to own too many of them? Do you eschew expensive items altogether, even if you have the money to purchase them? I found a fascinating article over at Get Rich Slowly about the morality of spending that you might also find an interesting read. Apparently my friend and I are not the only people thinking about this issue! I can’t wait to read what you have to say on this subject so do share your opinions with me! Detail of a 1975 Cartier crocodile necklace once owned by Maria Félix. The photo of the Cartier crocodile necklace detail above is from the beautiful book Amazing Cartier: Jewelry Design Since 1937 by Nadine Coleno. My nail polish is Caught Red-Handed by L’Oreal, one of my favorite shades for summer! I feel the same! While I don't have any children, I'm always conscious that I could be using my money in a "more important" way than buying expensive clothing, jewellery or accessories. Spending on luxury items is often scoffed at, which contributes to the guilt. Strangely enough, I feel no such guilt when spending money on travel (which is of course a luxury too) and I'm even encouraged by others to do so! I think it's because spending on items (especially things you can wear) is usually considered shallow, while spending on experiences is considered self-improvement and enlightenment. I deal with the guilty feelings by budgeting and only buying items that I draw genuine happiness from. I would imagine it's quite different with kids but Jill as you mention yours have all the important essentials so having a few really nice things that could be passed down one day to a daughter or daughter-in-law is a nice way to justify it as that very nice thing be even more treasured as family heirloom. My very frugal school teaher/Chruch music director grandmother always said "only buy very high quality (even if expensive) furniture since it will last for hundreds of years. The first thing I'll do once I get some really disposable income is getting some bespoke tailored suits from Anderson & Shepherd. With those I know I'd never let myself get fat. I think if you can afford it and all the basics are taken care of then it's up to you. Your Chanel bag is very cool! I have been wanting a Chanel purse for a long time now and I keep thinking it would be an investment pieces that I take out and enjoy on occasions. I would never put my own wants in front on my family's needs and really believe you should only buy it if it's something within your budget. I've been thinking of treating myself to a luxury item, but haven't done so yet. I'm not sure if it's the guilt (maybe a bit) or the fact that I enjoy the process of picking something out so much that I don't want to actually make a decision! Right now with the money there, each and every item is a possibility! I have a hard time putting that much money into one item. I have one Hermes scarf that I do cherish, but I honestly do not wear it so much more than other scarves that cost a fraction of the price. I chose not to have children but I still feel quite a bit of guilt if I'm over spending on fashion items. I would much rather spend the money on travel, but I am addicted to the immediate gratification that buying something offers. That is why I'm trying to curb the spending by only focusing on thrifted or consignment clothing. So far it has slowed down my purchases. A courageous and interesting topic, Jill! Like most people who read Harper's Bazaar and their ilk, I'm certainly not immune to the skillful branding of beautiful things. I agree that people are afraid of being seen as "shallow" for their purchases...hence the rationalizations on a lot of blogs about quality and craftsmanship, and comparisons with art collecting. What if people felt okay about naming the real reasons behind their purchases? Aesthetics, childhood/adolescent dreams, or even status? I wonder whether that would result in more mindful consumption overall. Thanks for opening up the dialog! This is the "elephant in the room" that no one talks about in the blogosphere. When my kids were at home, I did everything to make sure they had everything! Now, that I am a woman of a certain age, I like to occasionally treat myself with quality items. I do not feel guilty, but I also do what I can to find a deal...rarely pay full price. We lost our retirement money when my husband was laid off for three years, so now I have to make sure I contribute so a ship won't sink. But, I work more than one job and I think it is OK to enjoy luxury items occasionally and give myself a treat! Buy what you wish, is my belief. My thing is art and jewelry, and I'm not tempted by handbags over a certain $ threshold. So my grandson will get good jewelry and art one day. Honestly, if I one day get a granddaughter, I may get a thrill out of knowing she would one day carry Grandma's Chanel bags! Nope, I don't mock or resent anyone's luxury purchases. Hi Jane, how ARE you?!? Thank you so much for your comment, I think it is so insightful. There is a lot of talk about craftsmanship, etc., as maybe a way to justify such pricey purchases. So let me be totally honest: When I was in high school, in the Philippines, I had a fake Cartier watch that I think a boyfriend gave me, he probably got it in Olongapo, the town outside the Navy base, where you could buy replicas of anything! I loved that watch, it was the Santos model. And I really like the idea of owning, all these years later, a real Cartier watch, so what you wrote rings true for me--it would be an adolescent dream come true! Hi Lorna, thank you so much for comment, I love that sentiment so much, not judging anyone's luxury purchases. I get a thrill when I see someone else's Birkin or Cartier watch when I'm in Manhattan, especially when they wear them with style! It feels like a bit of beauty for me to enjoy too, when it's worn in public. Interesting topic, and one that comes up from time to time with friends IRL too. (I was "lucky" I guess to catch the Chanel bag bug just before the price curve was beginning to escalate, and picked up a small vintage flap for what would now be considered a song.) When I first could afford it and began upgrading my accessories, I felt guilty about spending over certain amounts, but like you, I try to balance "investment" accessories with lower-priced clothing items. I look at it from an amortization perspective. A pair of shoes that I'll wear frequently and for years (like my Stuart Weitzman ankle boots, the price of which made my head spin at the time but are now heading into their 10th year) have such a low cost-per-wear while something like a Max Mara coat, timeless and "basic" as it is wouldn't be worn here enough to justify the spend. The only high-end jewelry bug that's really bitten so far is the Cartier tank watch. I really want one too, and would wear it every day. Jill, these are all very valid and interesting questions that you pose. Overall my feeling is that as long as you're not doing anything illegal or hurting anyone (including yourself) then it's a very personal choice whether you choose to buy expensive things (or pursue an expensive or dangerous hobby for that matter). As to whether it is 'bad' to love expensive things, well if it is then I've been bad all my life! It's like taste, you can't account for it. When I was really young I did feel guilt for admiring Chanel and Hermes bags but as I grew up, I realised there are certain things about them that I simply and particularly love which are not present in other brands. I don't think there's anything wrong with that and choose to follow these interests when I was able to. I have a dear friend who has the means but 'expensive' things do not interest her in the same way. I don't think she attaches any kind morality to them, it's simply that they do not fill her with joy the same way they do me. To me, it's worse not using the accessories I've collected and yes, it's true to a certain extent that over time the cost per wear will reduce dramatically. I've always wanted longevity and never felt comfortable with the 'fast fashion' approach. It's taken a while but I hope I've reached a time now to both indulge in my interests and fulfill the goal of longevity/cost per wear reduction AND heritage items for my children. The extra dimension for me is that as I care for the leathers myself, it gives me more joy and a further connection to these *things*! I experience guilt on occasion. Not in regards to my family, as I'm not taking food out of anyone's mouth, or affecting their lifestyle in any way. Feelings of guilt come from knowing how hard it is for people to get ahead, living paycheque to paycheque; while I barely look at the total at the cash register. I enjoy every luxury I have, or experience. I love life, and living it, and never take it for granted. I spend a small fortune on bed linens, and I really don't care what anyone thinks about it. I spend much of my time working, from my bedroom, and I like to be cocooned amidst things that are personal,and pleasing to me. I'm a high/low mix, and I don't base my purchases on price. I love vintage, and enjoy shopping in thrift stores. I do spend money on boots, coats, and handbags; shoes not so much. I don't often buy expensive shoes. I generally purchase Nine West shoes. One or two Chanel jackets a year is where I splurge now; but only when I find one I love, AND they have it in my size. This isn't often the case; but I can wait. I won't buy a Chanel that has to be altered within an inch of it's life, just so they can make a sale. I don't need more "important" jewellery; I never wear much any way. I haven't visited my safety deposit box in over four years, and crazy enough didn't even think about it until just now! Knowing I'm a generous, and faithful friend, and having the means to support the COC and my charities, help snap me out of the guilt trips I sometimes place on myself.